Done with the holiday sales season. As you know, I spent yesterday at Crafty Underdog. Sales were not great — less than my studio sale the previous weekend, which makes me wonder why I bothered packing and hauling all that stuff around. But I met some nice people, especially my booth neighbors (Tara and Lyle). Two years ago, I wrote a post On Selling. Re-reading it now, my feelings haven’t changed, but I have more insight into what it takes to sell, what I ought to do and what I’m willing to do to make it happen. I did two sales this winter, and currently have work in two stores. I haven’t talked to Pistils since I dropped off my pots two weeks ago, but Lisa (Oko) consistently sells my hand built work — rocket planters and pots with feet. She occasionally sells a cup or a teapot. Sake sets never, ever sell. She doesn’t sell them, I don’t sell them. I love making them and I love the way they come out of the anagama (I fire them in place so each piece leaves shadows on the others and the fit together just-so). People always admire them but never buy them. They ask what they’re for, and I tell them sake, whiskey, anything you drink in small cups. But who takes the time to pour their beverage into a new bottle before serving? So…in 2012 I need to make some decisions and take action based on those decisions. 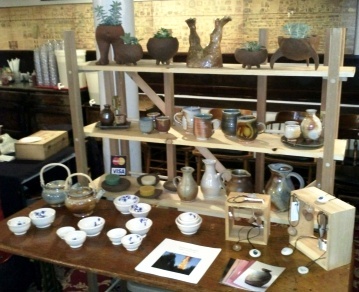 I can focus on making pots that will sell in the market I am currently serving (hand-built planters and footed things), or I can find a market for things that I really like to make (sake tasting rooms? tea shops?). I’ve fallen into my current market with little effort, so actively pursuing other avenues for sales is scary and will take work. But if I want to move forward, I think it’s what must be done.